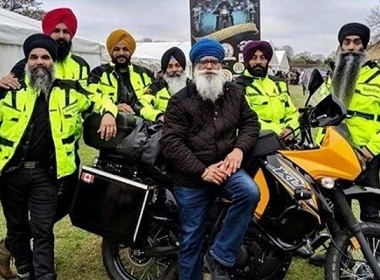 To spread message of humanism, six Sikh members of the Sikh Motorcycle Club Canada will travel from the United Kingdom to Golden Temple in Amritsar on the occasion 550th birth anniversary of the first Sikh guru, Guru Nanak Dev Ji. According to the reports, six bikers – Jasmeetpal Singh, Jantta Dhaliwal, Azadinder Singh Sidhu, Parvjit Singh Takhar, Sukhvir Singh Mlait and Jatinder Singh Chohan – will complete this tour in about 45 days. The bikers will cross multiple cities and countries before culminating the tour at Sri Harmandir Sahib in Amritsar. During their way, they will cross countries across Europe, Turkey and will also visit Guru Nanak’s birthplace in Pakistan. The club’s aim is to spread Guru Nanak Dev Ji’s message of humanism and to raise funds for Khalsa Aid International.